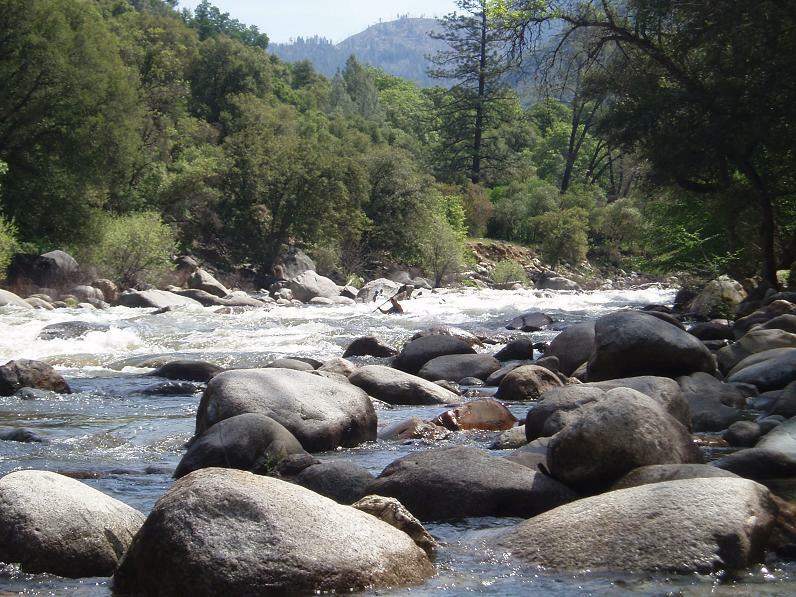 Diane and I made a weekend out of this river with Dave, Brian, Aleece, Beth as well as a few others. We met up with a guy named Laurie from New Brunswick who Brian had replied to a post on boof and invited along. I am fairly certain Brian saw his tag name was “lilbrowneyes” and the name “Laurie” and thought it was a girl, the surprise must have run rampant in that conversation. We had planned on putting in at the gas station, but high water (4,250 and 5,000) made us think twice each day. Regardless, it was a fun run. The gas station is about one mile further upstream from the 140 bridge; this stretch contains class V rapids at our flow. From 140 to Redbud, about two miles, is class IV water with some IV+. Below Redbud to Indian flat (another two miles) is class IV-, and below Indian Flat to the suspension bridge is class III with one IV- at our flow. Pick your put in for the flow as the rapids apparently change a lot as the flow changes. 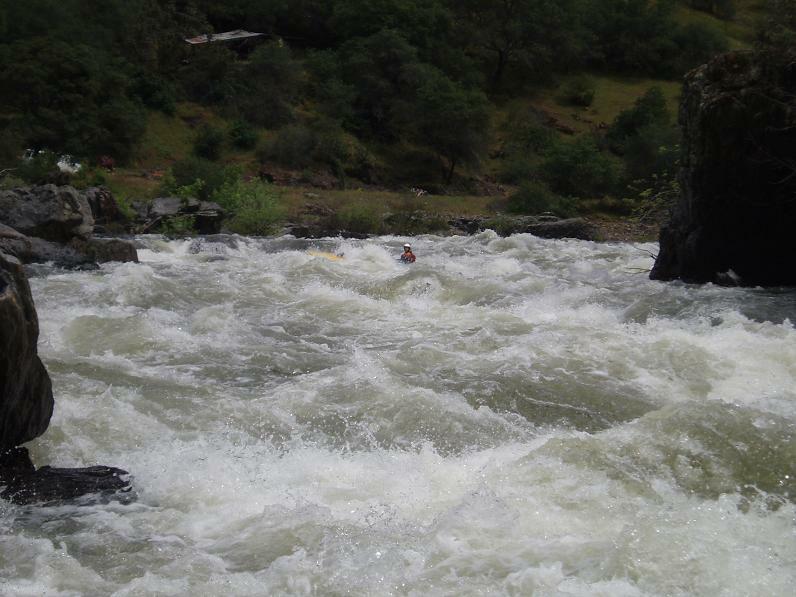 Update 2008: A year later I have finally made it back to the Merced and have run it at 1,500 and 1,800 cfs. The alterations to the right up are added below. 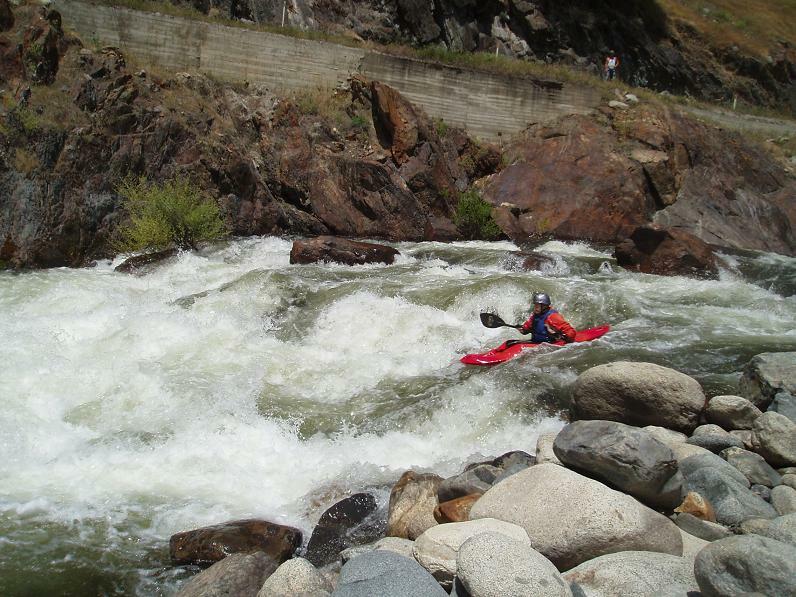 Update 2014: Several years have passed, and I returned to very low flow... 950 cfs. At this flow most of the teeth of the Pohono Bridge section were taken out. The continuous nature was not as demanding as the river was much slower. 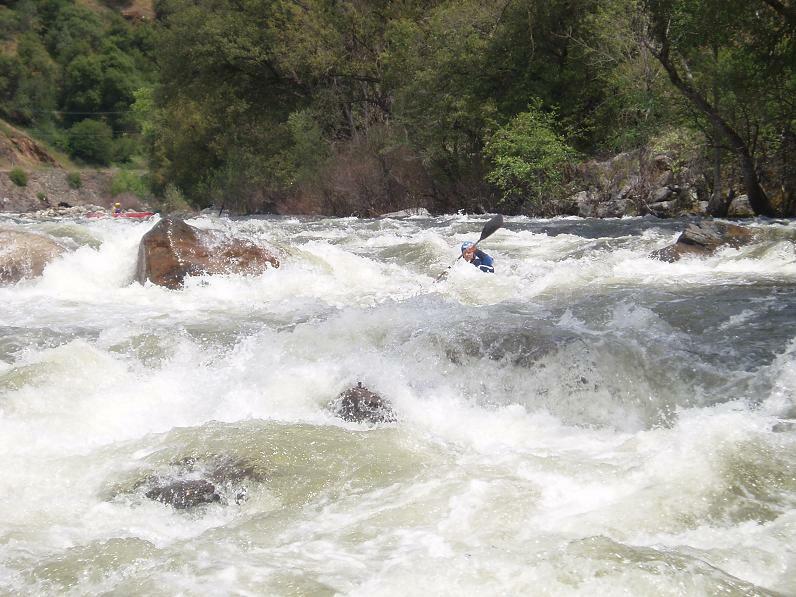 Additionally, the two big rapids in that section were much less pushy. 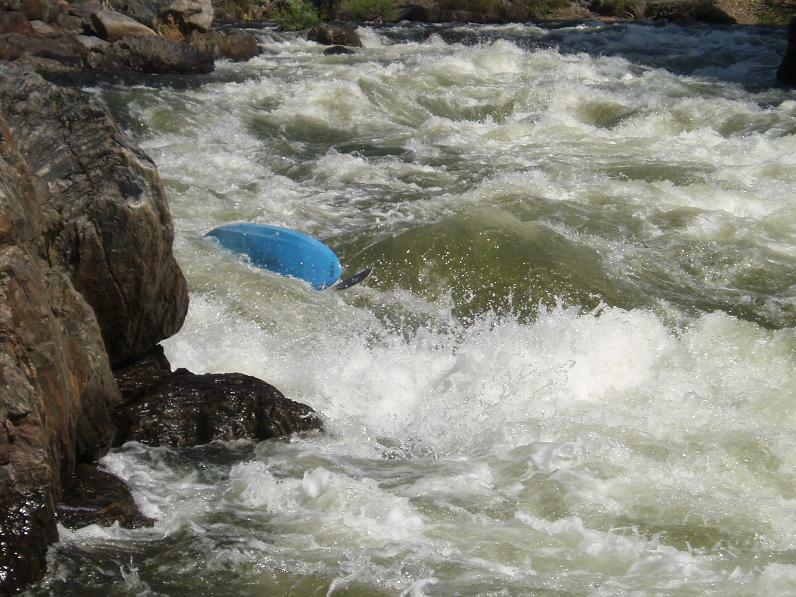 I would say that section at low flow is no harder than Chamberlains. For those looking for my spice... look upriver, put in as high as the Park Sign above the hotel for some class IV to V action to warm up on before joining your friends downriver for the less difficult section. First Rapid (IV to IV+). The first rapid starts immediately after pushing off shore. The key is to avoid the holes at the top. It starts to bend left after about a quarter mile, you will be forced to the middle channel to avoid a pour over, but then see a huge hole just downstream. We skirted the hole on the right and eddied out after 100 more feet. Update 2014: At low water, this was a very easy rock dodging affair, class IV- to IV in nature mainly because of its length. Tree (III+). A swim in the above rapid could be disastrous as just below (no pool what so ever) there is a tree across the river. There is a small channel about 20 feet wide on the right which goes around the tip of the tree. Parts of the tree can be seen downriver, lodged after they broke off. 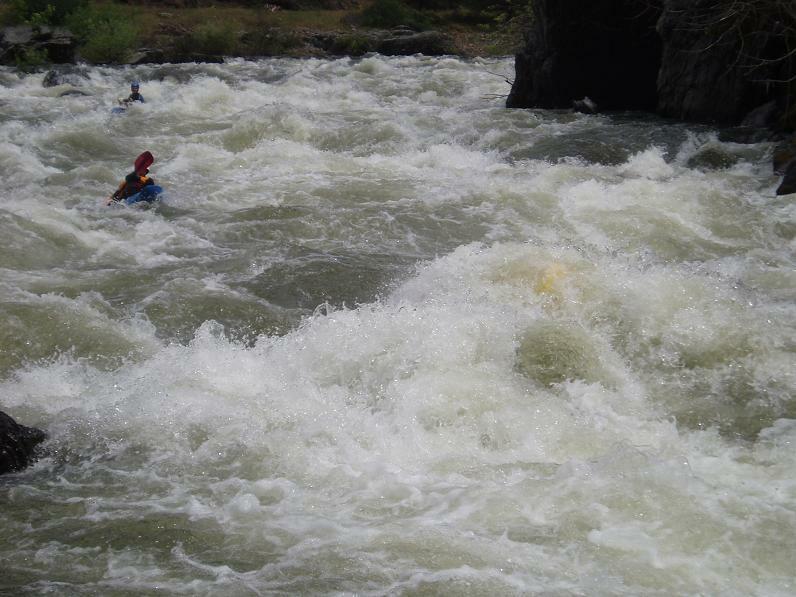 This rapid then bends around an easy class III which ends in some huge but avoidable holes, one of which swam Dave while chasing a kayak down. Update 2008: The tree is long gone and the channel is open, though there is still a fun line on the far right, there are still some good size holes throughout the runnout. Gravel Pit (IV to IV+). On a sharp left bend comes Gravel Pit. At our flow the lead in was simple, but required punching some holes. The crux came as the center side of the rapid drops into a hole, which is backed up by a wave that proves to be pour over, which would land you not only in the pour-over’s slack, but on a rock that is just behind the pour over. The best line is to skirt the first whole to the right, and shoot the tongue into the other large hole. Going right the whole way can lead into many large holes. 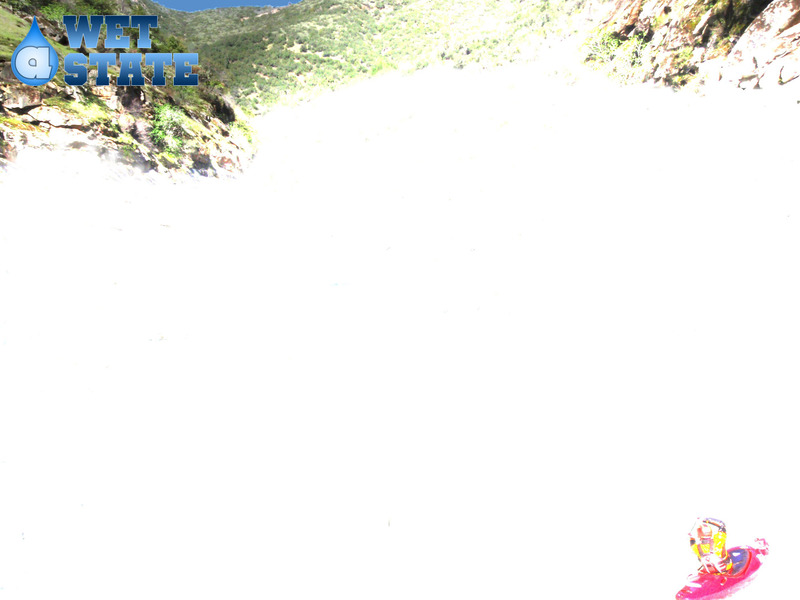 Update 2008: At the lower flows a chute on the right opens up, looks very steep from above but turns out to be ok. 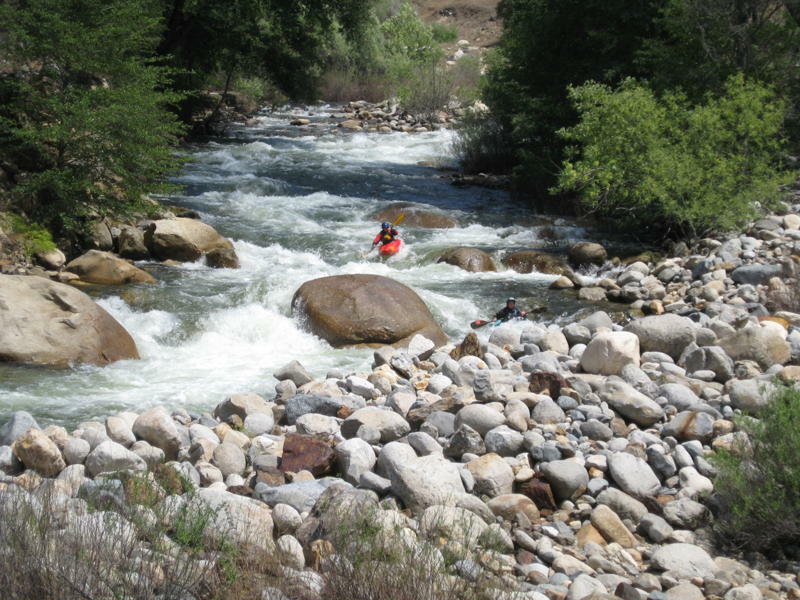 The left of the midstream rocks goes too but is bigger and harder than the right. Island (IV- to IV). Just below the Gravel, the river splits around an island. The left is runnable, but be careful as on the bend the river piles up on the wall and makes a very large eddy which would be bad to be in. The right is also runnable. Enter in the far right channel. Finish on the left shore of the channel to get left of the pour over rock. Update 2014: The left at low water is not big enough to boat down, you have to right. Nightmare Island (IV). Not far below Redbud, the river again splits. At low water the line is on the right (hug the left side of the channel to avoid the rocks in the middle and hole behind them), at high water this side goes into a macking hole, so we went left. Hug the right shore of the channel, this will allow you around a large hole in the center and away from the large pour over on the left. Update 2014: The left also still goes at low water, but is a bit boney. You can always scout from the road during the drive up. Chip Tooth (IV- to IV). Adding to Nightmare Island’s difficulty, Chip Tooth lies immediately downstream. The right and the left are runnable. Just done be in the middle. At high water the chipped teeth are huge holes. Go left of them and work right to finish. There are several lines available. You can cut in from the left behind the "teeth," you can floss the teeth, or you can run the easier raft line down the right of center. Flume (III) A huge flume on the left then leads to a great play hole at 1,200 on the Phono Gauge. Eddy Service and even park-and-play potential. Just upriver of Indian Flat park at the Picnic Area Ahead sign. Bouncy Wave (IV-). 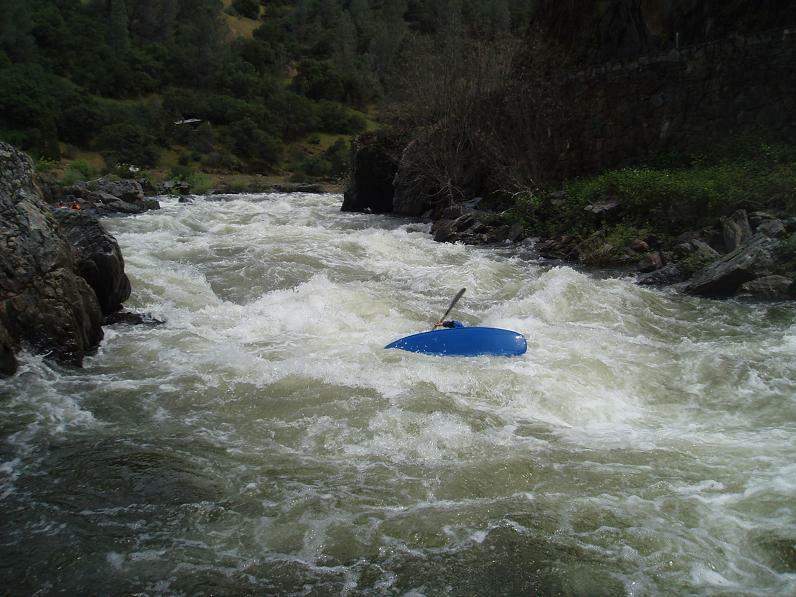 Just below Indian Flat, this rapid has a huge hole in the center and pour over on the left. Hug the shore rocks on the right and skirt the main hole. At low flows the left was runnable and fun. There are a few rapids on the road walls. 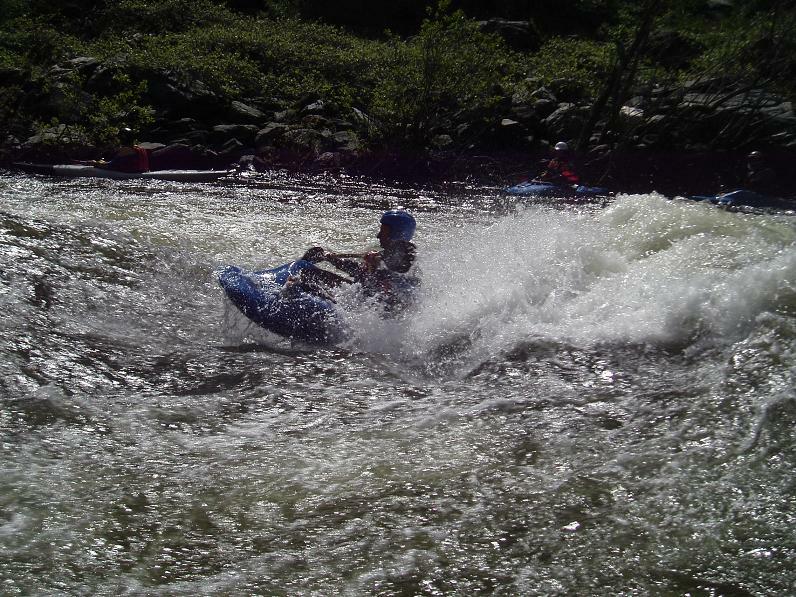 Large waves, a few large holes, but all of it went at our high flows. Turn (III+). On a right turn comes number of holes blocking the entrance to the rapid. 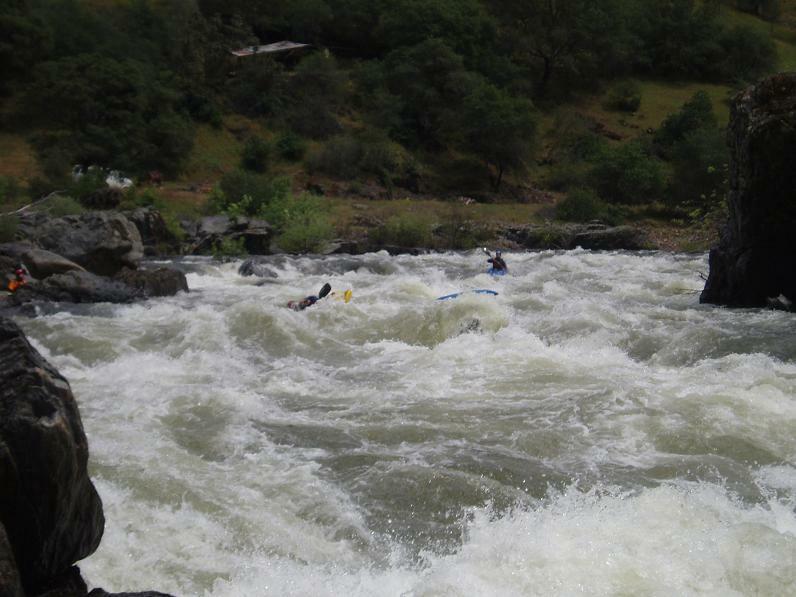 Shoot between the rightmost holes and run the rapid out. This rapid continues somewhat for the next mile up to Ned’s. This rapid has become the Landslide (IV). There is a pour over center right. A nice tongue is to the left of it, after that, turn left and run the rest out. At higher flows I can see the first ledge (tongue) becoming a river wide hole, scout right and while on the detour setting shuttle. There is a great play spot at the bottom, a hole at 1,200 and a wave at 1,800. Ned’s Gulch (IV). 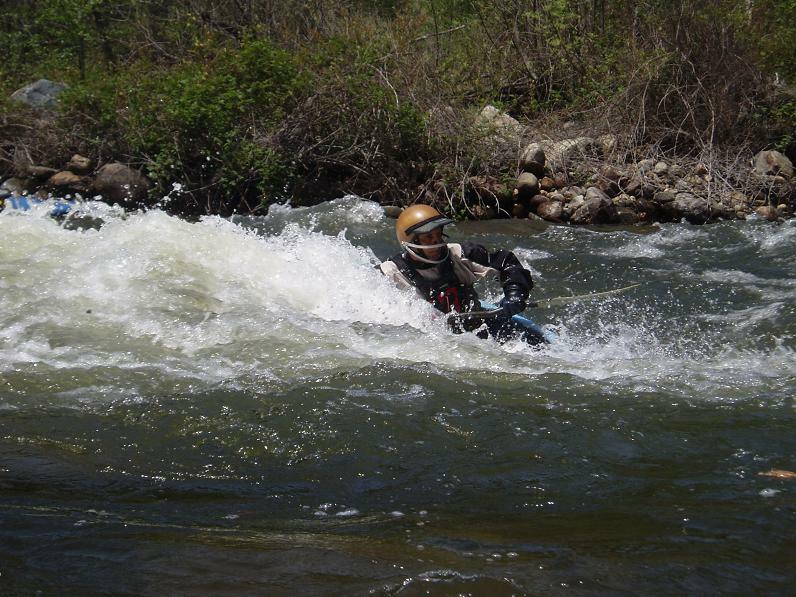 At our flow this rapid was easy. Enter center or left of center and ride it down. There is a large curling wave at the bottom which is easiest to avoid on the left if wanted. Update 2008: At lower flow enter center moving right. Just be right of the rock in the middle at the bottom. There is a hole on the right below, we ran the meat, but some may want to avoid to the left. Below the take out you can run a class II stretch of river which takes you to Briceburg. Take out: The take out is located on Highway 140 about 5 miles upstream of Briceburg. Go past a few creeks, the last is Sweet Creek. It is 1.15 miles past the historic Sweet Creek on a right turn near a 30 mph sign. Put in: Continue up highway 140 about 10 miles until you cross the river. Put-in is on the right before the bridge, or on the left and right after the bridge.